EMU industrial output expands in all sectors in May. All sectors and subsectors in the table gained 1% on the month or more except capital goods where output gained 0.7% month-to-month. Over three months, the rebound is strong with the headline gaining 3.8% (annualized) led by consumer goods output which in turn is led by nondurables output. However, capital goods output is surprisingly strong for that usually tempered sector with a rise at an annual rate of 9.8%. Intermediate goods output rose at a 3.4% pace. The six-month growth rate put the three-month growth rate in perspective. Over six months, output is falling at a 1.1% pace. And capital goods output is falling at a 4.1% pace. Much of the rebound over three months is simply recovery from weakness of the prior three months. Year-on-year IP growth is more or less a normal 2.3%. Consumer goods output is up by 2.4%, intermediate goods output is up 2.3%, and capital goods output is strong, rising by 4.2% over 12 months. For the quarter-to-date, output remains weak, however. This highlights the fact that the three-month growth is growth from a weakened previous period. So the strength we see over three months derives a lot of its pace from a launch from a depressed base. Quarter-over-quarter growth rates use an averaging process. They look at the average for output in Q1 and look at the average (or average to date) for the next quarter then calculate the growth rate of one average over the other being careful to center them properly and use the correct compounding factor. When that is done, two months into Q2 for 2018 EMU output is falling on a QTD basis. Manufacturing output is up at a 1% pace. Consumer goods output is up at a 1.8% pace. But intermediate goods output is off at a 1% pace. Capital goods output is up at a 5% pace. Looking out across the sample of European countries featuring original EMU members, we find output advanced in May in 10 of 14 countries in the table; it advanced in eight of eleven EMU members. April had been a difficult month with output falling in seven of eleven EMU members. The May and April output levels make up the quarter-to-date period for Q2. Sequential growth rates find mostly uneven growth patterns across these member states. 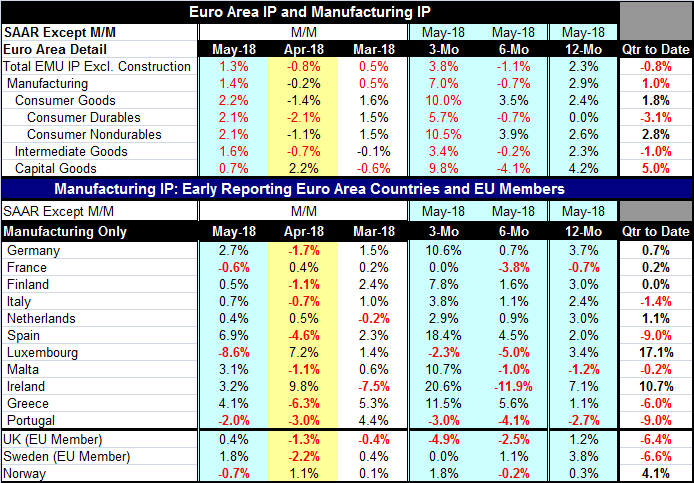 Overall EMU IP fell over six months only five of eleven of these EMU member countries seeing output fall (EMU-wide manufacturing output fell at a 0.7% pace over six months). Only three EMU members France, tiny Malta and Portugal have industrial output lower on balance over 12 months. But quarter-to-date five of eleven countries have IP lower and Finland has IP unchanged on that basis. What is clear is that industrial output still seems to be expanding. Output is lower quarter-to-date (with two of three-month’s data in hand) because of a significant slowdown recently, but the other trends point to ongoing expansion. At this point, we can’t say that IP will be up or down in Q2. The June report will decide that. But it does seem clear that output is still on an expanding path and also that it has slowed. The question for the future is how much has IP really slowed. As of April, the slowing looked dramatic. But with the sharp rebound in May, that is much less the case. We are still going to have to wait to tell. But other reports like the Markit PMI readings, for example, clearly show some slowdown. Consumer confidence and investor confidence metrics for Europe and Germany have been losing some luster. It does seem clear that some momentum has been lost. Today the European Commission reduced its growth outlook for 2018 to a 2.1% pace and to 2% for 2019. Previously the 2018 pace had been set at 2.3%. Even with this growth downgrade, the EU Commission is looking for growth to strengthen in the second half.